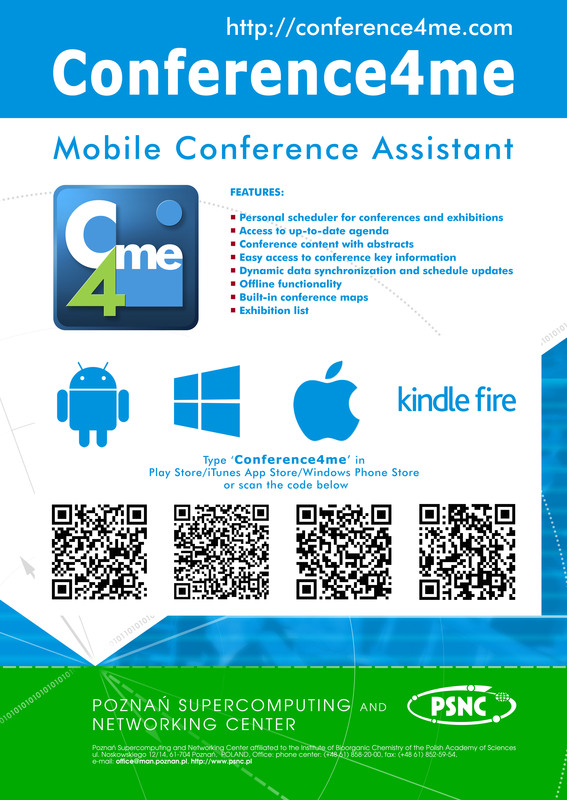 The Conference4Me mobile app containing comprehensive LIBER 2016 information is now available! You can download it to your mobile device using the following links or using the scannable QR codes in the poster below. When you have installed the Conference4me app, you will be prompted to download an agenda for a conference of your choosing. You can find the LIBER 2016 agenda from the June section of the list of downloadables. Just click on that, and you’ll be all set! The app contains all the info you need about the conference, including session schedules with abstracts, zoomable maps, hotel, exhibition and sponsor info and much more! You can also customize your conference schedule by picking sessions which you will participate in and adding them to your personal agenda. Also included in the app is the Twitter feed with the #liber2016 hashtag, so anyone attending the conference can stay up to date on the latest tweets about the conference – without the need to install any additional programs!